Creamy Tomato Basil Soup with Parmesan is 1000X better than any canned/carton variety, is bursting with flavor and requires no roasting and hardly any chopping! I first posted this Tomato Basil Soup recipe way back in February 2014 – my first MONTH of blogging! This tomato soup continues to be a family favorite and deserved a photo makeover because everyone deserves this deliciousness in their lives! This easy Tomato Basil Soup is creamy comfort food loaded with pureed tomatoes, carrots, celery, onions, garlic and basil for multi-dimensional flavor and layers of YUM! You can never go wrong at dinner time with this easy, make ahead friendly, satisfying Tomato Basil Soup! While I love the summer months of sandals, and jacket-free bike rides, I love the winter because SOUP! Soup season is my favorite because soups are my favorite. I love how you don’t have to create any extra sides but instead get to curl up with your meal-in-one bowl of warm slurpilicoius comfort food like my One Pot Lasagna Soup, Zuppa Toscana, Italian Vegetable Soup and Minestrone Soup. 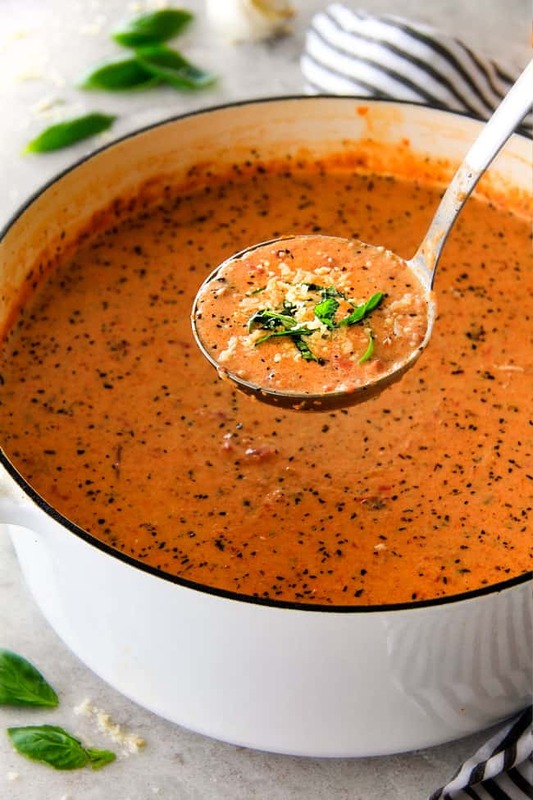 If someone is intimidated by cooking, I always tell them to start with my Soups recipes and YOU should start with this Creamy Tomato Basil Soup recipe! The first time I made this Tomato Basil Soup, I shared it with a friend after she had a baby and shortly after received the following text, “That food blew all our minds!! That soup was incredible. Seriously my dad can’t stop talking about it….” And more recently when I served this easy Tomato Soup to company, they couldn’t start raving about it. I see a pattern here. 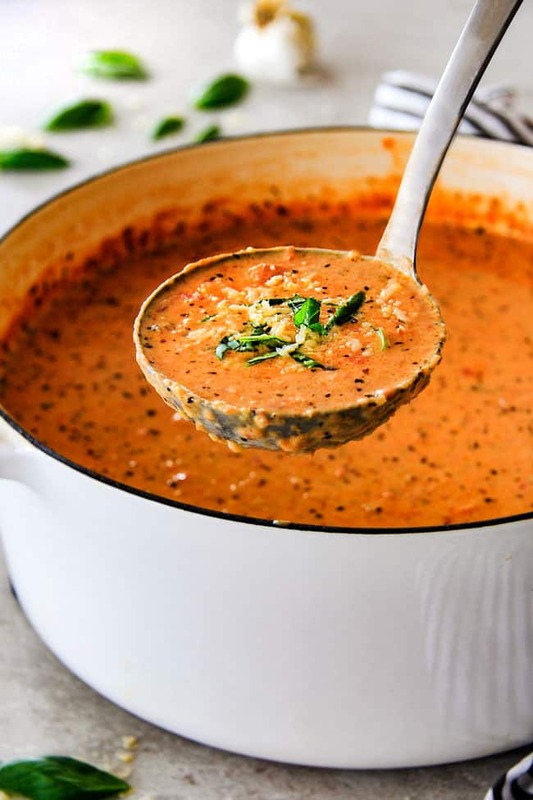 Because this Creamy Tomato Basil Soup leaves you licking your lips with its layered flavors of minced celery, carrots, garlic and onions, simmered with fire roasted tomatoes, oregano, and basil and then made ridiculously more delicious with the addition of Parmesan cheese and cream (or milk). Drool. There are many different names of Tomato Soup – Tomato Bisque, Tomato Cream Soup, Cream of Tomato Soup etc., so how do you know if you’re eating tomato soup or tomato bisque? You know you are eating a bisque if the broth is from a shellfish, like lobster or crab. Bisque is a French term used for creamy (added milk or cream) soups based on “coulis” (crustaceans) broth. Today, however, the modern use of bisque is any soup that’s been pureed or is extra creamy. So, this creamy Tomato Basil Soup can easily be called a soup or a bisque because it’s made of pureed vegetables and cream. 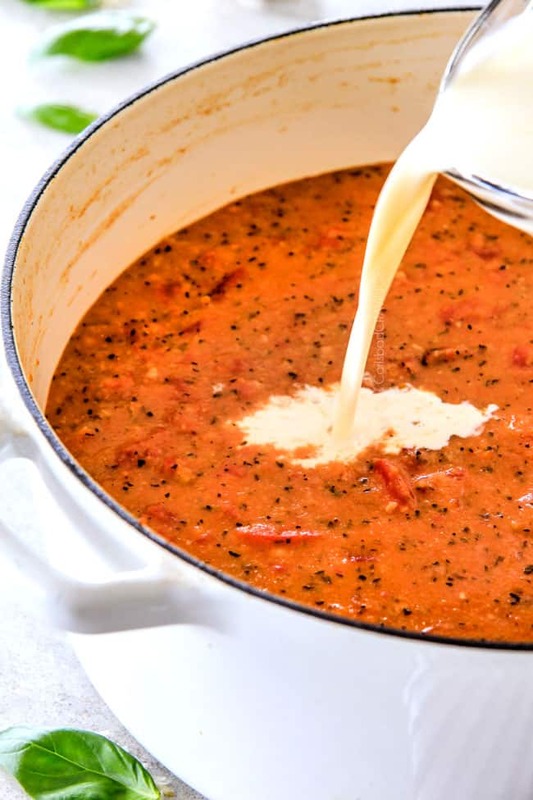 So, whether you’ve been looking for the best Tomato Soup recipe OR the best Tomato Bisque recipe, your search stops here with this Tomato Basil Soup, Bon appetit! WHAT TYPES OF TOMATOES SHOULD I USE FOR TOMATO SOUP? My favorite tomatoes to use for shortcut, easy Tomato Basil Soup are two cans of fire roasted diced tomatoes. These tomatoes offer a huge shortcut from roasting your own tomatoes (although I’ve included instructions below to make your own Roasted Tomato Soup). Fire roasted tomatoes are gently roasted over an open fire for a great smoky flavor which enhances the sweetness and mellows the acidity – no acid reflux tomato soup here! Carrots, Celery, Onions Garlic: These veggies are finely chopped in the food processor to create a Mirepoix (pronounced “meer-pwah”). Mirepoix is a fancy French term for the combination of diced carrots, onions and celery sautéed in butter/olive oil – mmmm. Every chef will tell you that every great soup or stew should begin with a mirepoix – and I heartily agree. The dimension of flavor from the vegetables adds a richness to the Tomato Basil Soup that can’t be achieved any other way. butter: use unsalted butter so you can control the salt level. I love the added butter flavor but you can substitute with olive oil for an even healthier soup. olive oil: use extra virgin olive oil for more flavor. You can substitute with your preferred cooking oil if you wish. flour: you can substitute gluten-free flour to make gluten free Tomato Basil Soup. chicken broth: use low sodium chicken broth so you can control the salt level. You can substitute vegetable broth for vegetarian Tomato Basil Soup, otherwise, I recommend chicken broth because it has more flavor. fire roasted diced tomatoes: can be found in the canned section next to traditional diced tomatoes. Some people think “fire roasted” means they are spicy – this is not the case. Fire roasted simply means roasted to enhance the flavor. basil: you can use either 1 tablespoon dried basil or 1/4 cup fresh basil, chopped. oregano: you can use 1 teaspoon dried oregano or 1 tablespoon fresh oregano. seasonings: you can adjust to taste, but this is my favorite combination. milk, half and half or heavy cream: you can use whichever dairy product you prefer depending on what you have on hand and if you are trying to save calories. Keep in mind that the higher the fat content, the creamier the soup. So, for the creamiest soup, use heavy cream. Parmesan cheese: use only FRESHLY grated Parmesan cheese so it will melt easily. Pre-shredded cheeses are coated in anti-clumping chemicals which also prevents them from melting easily. Step 1- Chop Veggies: First, mince the vegetables in a food processor so you don’t have to spend any time/effort chopping. The generous amount of carrots and celery add an untraceable sweetness which balance the acidity of the tomatoes and when combined with the onions and garlic infuse this Tomato soup with irresistible multi-dimensional rich flavors. Step 2 – Saute Veggies: Next, saute the minced vegetables for a few minutes to soften then sprinkle in flour and cook for another minute to get rid of the raw flour smell. The mixture will be thick, which is okay. We are essentially creating a roux with vegetables which will thicken our Tomato Basil Soup. Step 3 – Add Broth: Whisk in chicken broth, fire roasted tomatoes and our dynamic cast of basil, oregano, parsley, salt, pepper and a bay leaf. Step 4 – Simmer: Simmer for 15 minutes or until the carrots are tender. This not only tenderizes the veggies but melds all the flavors together. Step 5 – Get Creamy: Whisk in our generous amount of Parmesan and either milk, half and half or heavy cream. It is entirely up to you which of these three you want to use just remember that the higher the fat content, the creamier the soup. 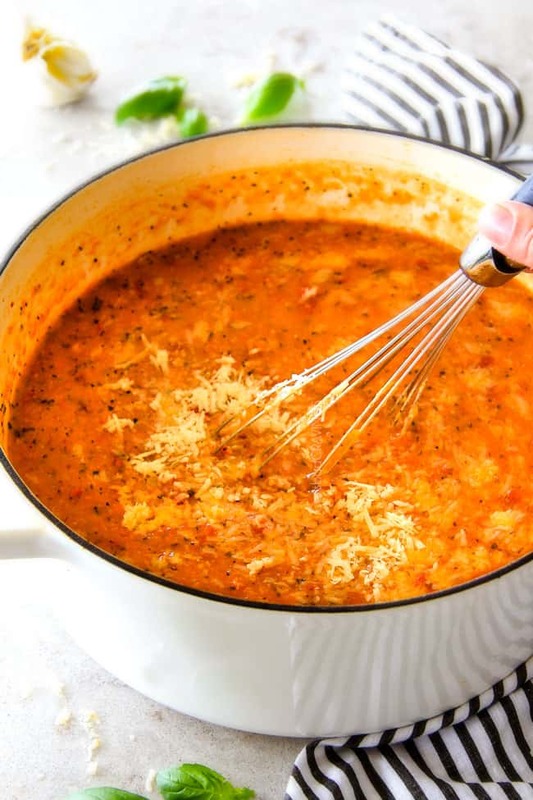 Step 6 – Simmer Again: Finally, simmer the Parmesan Tomato Basil Soup for an additional 15-20 minutes for the flavors to develop more fully into robust deliciousness. Step 7: Puree Soup: At this point you can devour the soup as is if you want texture OR you can proceed to puree with an immersion blender or your blender. How do I Make Tomato Soup Creamy? The best part of Tomato Basil Soup is its luscious, velvety creaminess. To achieve the CREAMIEST tomato soup, I HIGHLY recommend using your blender over an immersion blender. I find an immersion blender can’t blend everything, so you’re left with bits and pieces here and there. I use a blender in my Cauliflower Soup recipe, Broccoli Soup Recipe, Sweet Potato Soup and Curried Butternut Squash Soup recipes and the texture can’t be beat! If you’re using your blender, just take care to let smoke escape or it will explode. I do this by leaving a corner of the blender lid open and covering the opening with a paper towel. No casualties yet! How do I Thicken Tomato Soup? Cornstarch: Remove some of the pureed soup and whisk in 1-2 tablespoons cornstarch with a fork until smooth then whisk it back into the soup. Simmer for 5 minutes or so until thickened. Flour and butter: Mix equal parts flour and softened butter together with a fork so it becomes a thick paste and almost forms a ball. You will want 2-4 tablespoons each, depending on how thick you want the soup. Add it to the soup stir, and simmer for 5 minutes or so until thickened. CAN YOU MAKE TOMATO BASIL SOUP IN ADVANCE? Tomato Basil Soup reheats beautifully because it is a pureed soup, so it is perfect to make in advance. You can even meal prep by adding serving size portions into separate containers for the week (or up to 5 days). You can reheat individual servings in the microwave or heat larger quantities on the stove until warmed through. HOW DO I REHEAT CREAMY TOMATO SOUP? Crockpot: transfer your Tomato Basil Soup to the slow cooker and heat on low for 1-2 hours, or until heated through (time will depend on the quantity of soup and size of your crockpot). Stove: reheat large batches on the stove over medium low heat, stirring occasionally until heated through, taking care not to let the soup boil. Microwave: For smaller batches or individual servings, transfer Tomato Soup to a microwave-safe dish, cover with a microwave-safe lid or paper towel. Microwave for 2 minutes, stir, then continue to microwave for 30-second intervals, if needed. HOW LONG CAN YOU KEEP TOMATO BASIL SOUP IN THE FRIDGE? Tomato Basil Soup should be stored in aright containers in the refrigerator. When stored correctly, Tomato Basil Soup will last about 4-5 days. CAN YOU FREEZE TOMATO BASIL SOUP? YES! 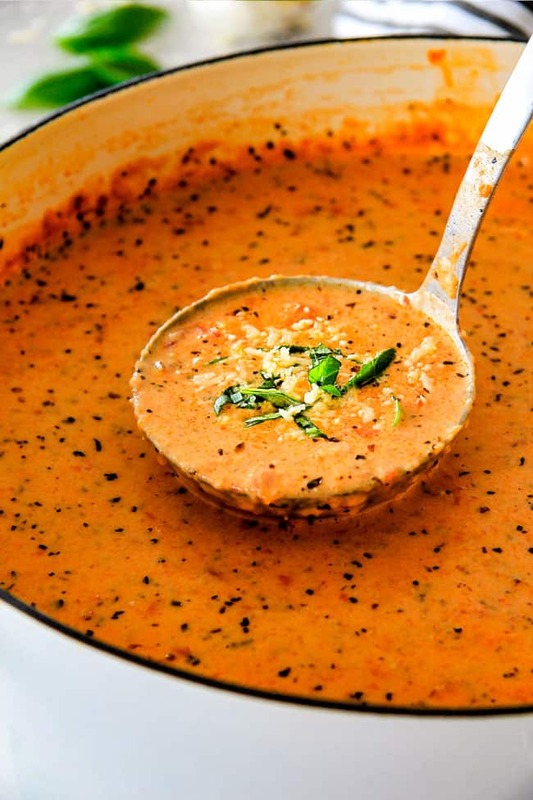 Many soups with dairy do not freeze well but this Tomato Basil Soup freezes great because it is all pureed together. Cool. Cool Tomato Basil Soup completely before freezing. Package: Transfer soup to a freezer safe container. You can use sandwich size plastic bags for individual soup portions, quart size bags or freezer bags. To easy fill these bags, place them in a container that you can wrap the top around the edge of – for example, place a sandwich size bag in a mug then cuff the edges around the mug. This keeps the bag open and prevents it from collapsing when you are pouring in your Tomato Basil Soup. Squeeze out any excess air then seal and label. Freeze. Freeze Tomato Basil Soup for up to three months. Defrost/Reheat. The easiest way to thaw your soup is in your refrigerator overnight then reheat on the stovetop or in the microwave. FUN GARNISHES FOR TOMATO SOUP! What do you eat with tomato basil soup? 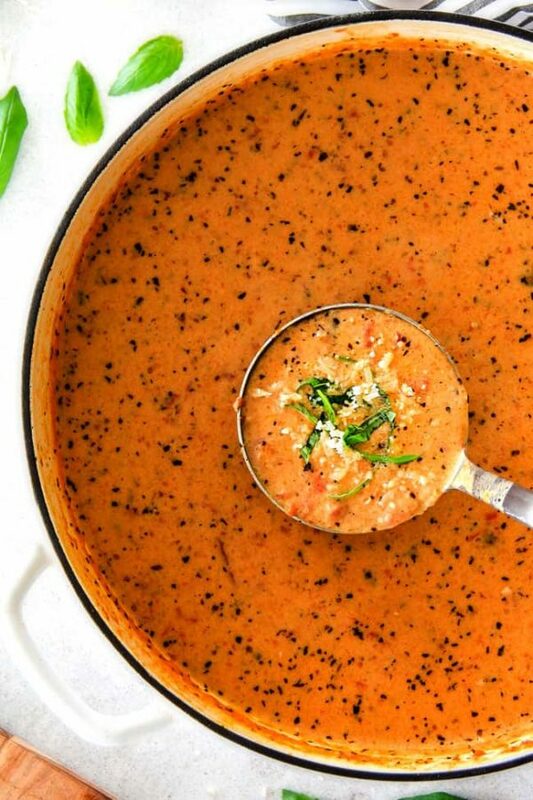 By substituting a few ingredients, you can make this Tomato Basil Soup Dairy free, Gluten free and Vegan, giving this simple and wonderful soup a place at everyone’s table, or bedside. Maybe it is January 1st ,and we are starting the year off with a weight loss goal or you plum ran out of cream, no worries! You can still enjoy a bowl of fabulous Tomato Basil Soup to warm you! You can substitute the cream for milk, almond milk, coconut milk or even chicken broth. The tomato soup won’t be quite as creamy but it will still boast all the tantalizing flavors. If you go this route, then you might want to whisk in 2 tablespoons cornstarch to whatever liquid you substitute the cream with to add more body to the soup. You can omit the dairy completely in this Tomato Basil Soup and substitute with coconut, almond or cashew milk. I have heard great things about coconut milk in this recipe although I cannot personally vouch for the variation. As mentioned above, I would whisk 2 tablespoons cornstarch to whatever liquid you substitute the cream with to add more body to the soup. Once you omit the Parmesan, you are losing some of the nutty, saltiness, so you may need to add additional salt to taste. This Tomato Basil Soup is very simple to make gluten free! Simply replace the flour with gluten free flour or whisk 2 tablespoons cornstarch into part of the chicken broth until smooth to create a slurry. The general rule of thumb is you need half the amount of cornstarch as flour. To make Vegan Tomato Basil Soup, use vegetable broth instead of chicken broth, omit the Parmesan and replace the milk/heavy cream with coconut, almond or cashew milk. Again, I would whisk 2 tablespoons cornstarch to whatever liquid you substitute the cream with to add more body to the soup. If you have more time, you can roast your own tomatoes and garlic for ROASTED Tomato Basil soup! Roasted tomatoes: Roasting the tomatoes helps them to sweeten and slightly caramelize which, in turn, leads to a sweet, rich soup flavor. You can use either Roma or plum tomatoes. I recommend using garden fresh or organic to keep the soup as flavorful as possible! Roasted garlic: Roasted Garlic is never a bad idea and it is easy to do right alongside the tomatoes. You can also buy roasted garlic if needed. Caramelized onions: Have you tried my French Onion Soup? Well caramelizing onions is a brainchild from that. The sweet onions are caramelized, and then blended into the soup. AMAZING! Preheat oven to 400 degrees F. Line a large baking sheet with parchment paper. Cut tomatoes in half. Place halved tomatoes and whole garlic cloves on the baking sheet and drizzle with 3 tablespoons of olive oil. I always shake around the pan to mix around the oil. Generously season with salt and pepper. Place in middle rack and roast in the oven for 40-45 minutes. During the roasting time, you can make the caramelized onions: Melt 1 tablespoon olive oil with 1 tablespoon butter in a large Dutch oven over medium-high heat. Add the onion slices and stir to coat the onions with olive oil and cook for five minutes, stirring occasionally. Reduce heat to medium and cook onions, stirring occasionally, scraping the bottom and sides of the pan, until they are deeply caramelized. Add the chopped veggies and continue with the recipe as outlined. Want to try this Tomato Basil Soup Recipe? Pin it to your SOUPS or DINNER BOARD to for later! This wonderfully easy, creamy Tomato Basil Soup with Parmesan is 1000X better than any canned/carton variety, is bursting with flavor and requires no roasting or chopping! This Tomato Soup continues to be a family favorite and deserved a photo makeover because everyone deserves this deliciousness in their lives! Add celery, carrots, onion and garlic to a food processor and pulse until finely minced (or mince by hand). Melt butter in oil in large Dutch oven/soup pot over medium heat. Turn heat to medium high, add minced vegetables and saute for 4 minutes. Sprinkle in flour and continue to cook 1 minute, stirring constantly. Gradually whisk in chicken broth followed by tomatoes and all seasonings. Add bay leaf. Bring to a boil then reduce heat and simmer for 15 minutes or until carrots are tender. Add Parmesan cheese and whisk to blend. Stir in milk/half and half/cream/milk and gently simmer an additional 15-20 minutes on low, stirring occasionally. Stir in additional chicken broth or cream to reach desired consistency. Remove bay leaf. Season with salt and pepper to taste. You can serve the soup as is if you like the texture or proceed to puree with an immersion blender or working in batches, transfer soup to blender and puree until smooth, being careful to let smoke escape or it will explode. ***Using a blender will give you a MUCH smoother, creamier soup. *** Garnish with freshly grated Parmesan cheese (optional). *I actually prefer dried basil in this recipe as it delivers a more concentrated flavor. ***The higher the fat content, the creamier the soup. **** I leave a corner of the blender lid open and cover the opening with a paper towel. You can substitute the cream for milk, almond milk, coconut milk or even chicken broth. The tomato soup won't be quite as creamy but it will still boast all the tantalizing flavors. If you go this route, then you might want to whisk in 2 tablespoons cornstarch to whatever liquid you substitute the cream with to add more body to the soup. You can omit the dairy completely in this Tomato Basil Soup and substitute with coconut, almond or cashew milk. I have heard great things about coconut milk in this recipe although I cannot personally vouch for the variation. As mentioned above, I would whisk 2 tablespoons cornstarch to whatever liquid you substitute the cream with to add more body to the soup. Once you omit the Parmesan, you are losing some of the nutty, saltiness, so you may need to add additional salt to taste. Just wanted to say, I have been making this soup for years and it is one of my favourites. I occasionally add in sweet potato or roasted capsicums to add extra vitamins. Thank you for this delicious recipe! Thanks for taking the time to comment Elizabeth, I love hearing this Tomato Soup is such a favorite! Your addition of sweet potatoes and peppers sound divine! I can’t wait to try that next!